Name meaning: The street is named for the Hinton family, who first acquired land in the area in 1837, and established a farm here by about 1858. Patriarch Joseph Hinton was one of the true pioneers of Nepean, having been one of the first settlers of the military settlement in Richmond in 1825. His son Robert (born in 1831) became the first of the family to move to the future Hintonburg area (he is listed as operating a 165-acre farm between Parkdale and Harmer as early as 1858). Joseph joined his son in this area in the late 1860s, and helped establish the first post office, school and town hall in the neighbourhood. The community was named "Hintonburg" in 1879-1880. 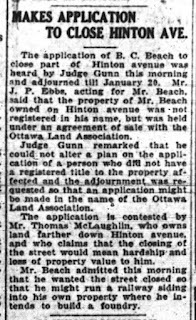 How named: The Ottawa Land Association had acquired the Hinton family farm in 1892 (from Andrew Holland, who had acquired it in 1887). 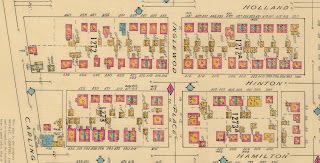 In 1895, they re-subdivided the farm, keeping part of the original Hinton subdivision from 1874, but largely establishing a new grid layout of streets. Included in this new plan (Carleton County Plan 157) was the new Hinton Avenue, running from Scott Street (then called Ottawa Street) south to Carling Avenue (then called Manotick Street). 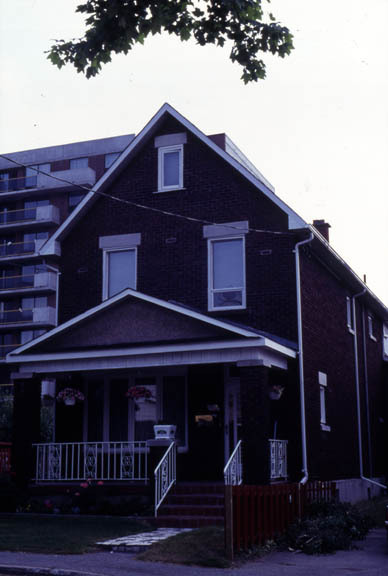 Hinton Avenue was likely selected as the name for the street it was in particular, because the original Hinton farmhouse was located almost exactly where Hinton Avenue now runs, set back a little from Wellington Street. Hinton Avenue was first laid out in the plan filed in October of 1895, and officially registered on the 31st of December of that year. 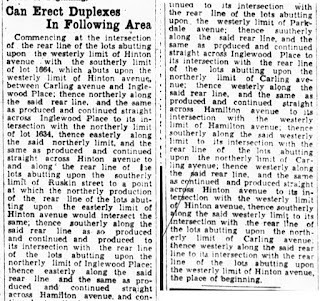 Lot sales could have began as early as January 1896, but the OLA plan was almost strictly for speculators at that point. Aside from the appeal of lots alongside Richmond Road/Wellington Street, it was the coming streetcar that was going to help sell the land in this then-isolated former farmland. It was April 1896 that the first streetcar travelled down Wellington and turned up Holland to the Experimental Farm (see https://kitchissippi.com/2016/01/21/ottawa-streetcar-history-byron/ for more details on that). But with the OLA holdings being so vast, there was simply very little that made the Hinton Avenue lots stand out at that point, and in general lot sales were at a trickle in those first few years. The first lot sold on Hinton Avenue was sold on December 17th, 1897. 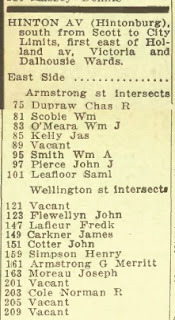 Lot 1522, at the north-west corner of Richmond Road, was sold to Thomas E. Burnside for $250. Burnside was a foreman at the McKay Mills in Ottawa, but more than that, he was the 30-year old son of long-time area farmer Christopher Burnside (the family of which is honoured in the name of the Mechanicsville street). 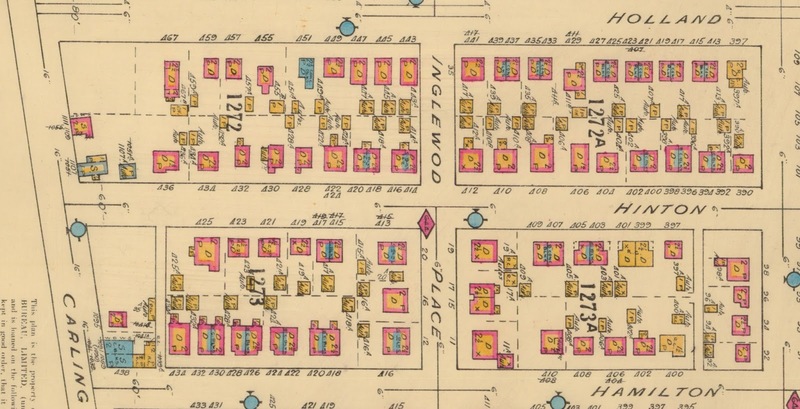 Seven months later, on July 21st, 1898, Burnside would also purchase lots 1520 and 1524, to give himself a large square at that corner (where the Royal Oak is now located). Around 1901, a house was built here, that would later serve as a social club, grocery store, butcher's shop and beauty parlor. 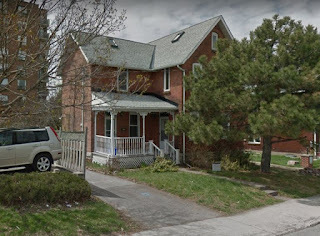 On May 30th, 1898, David and Mary Agnes Rice purchased lot 1349 from the OLA for $300, and took out a mortgage for $700 on the same day, building a home fronting on Richmond Road, at the north-east corner (at 205 Richmond Road, later 1213 Wellington Street, and where the Westpark bowling alley parking lot exists today). More on the commercial history of the corner of Hinton and Wellington a little further down in this article. 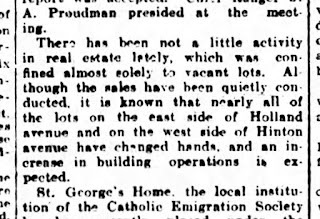 The first lots sold that actually fronted onto Hinton Avenue itself were sold a little later in 1898. On July 12th, 1898, Jabez E. and May Kenny purchased lot 1345 for $250, and took out a mortgage for $700 on the same day to build their house. They constructed 97 Hinton Avenue by the end of 1898. The young couple had been married in 1896, and had recently celebrated the birth of their first child, a son in 1897. 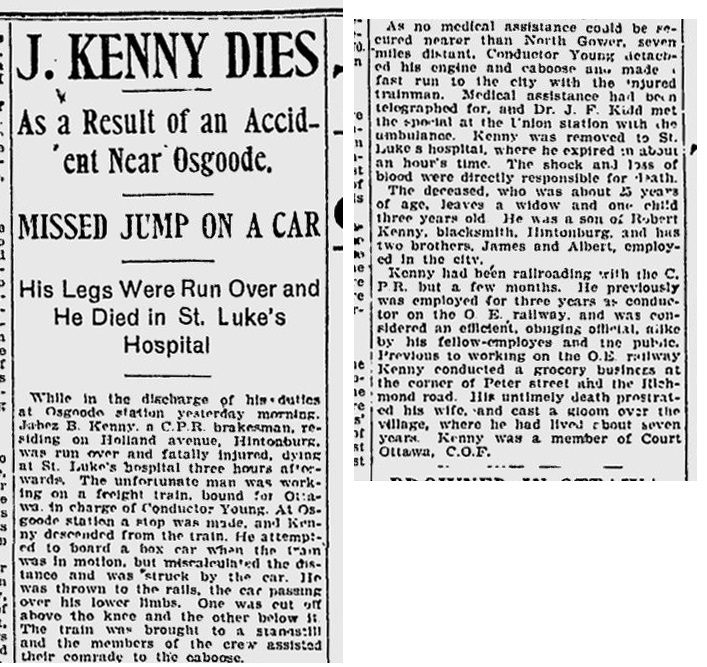 Jabez Kenny was only 23 years old, and had been running a grocery store on Richmond Road in Hintonburg before gaining employment as a conductor on the Ottawa Electric Railway. 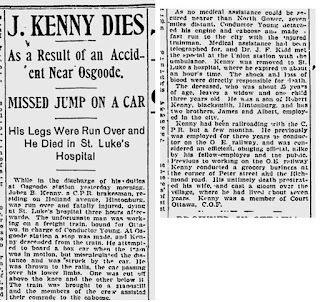 Perhaps Kenny drove some of the streetcars that would have gone by his own new house, on the way to and from Holland Avenue. 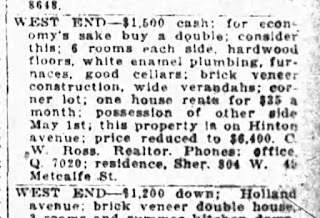 Meanwhile, two months after Jabez purchased his lot, on September 19th, 1898, his father Robert Kenny, a blacksmith, purchased lot 1518 across the street for $175, and took out a mortgage for $1,000 on the same day, to build 98 Hinton Avenue. 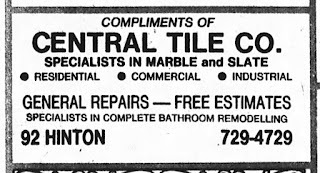 98 Hinton was torn down sometime in the 1980s. In March of 1899, Robert sold 98 Hinton to James W. and Mary Burnett. 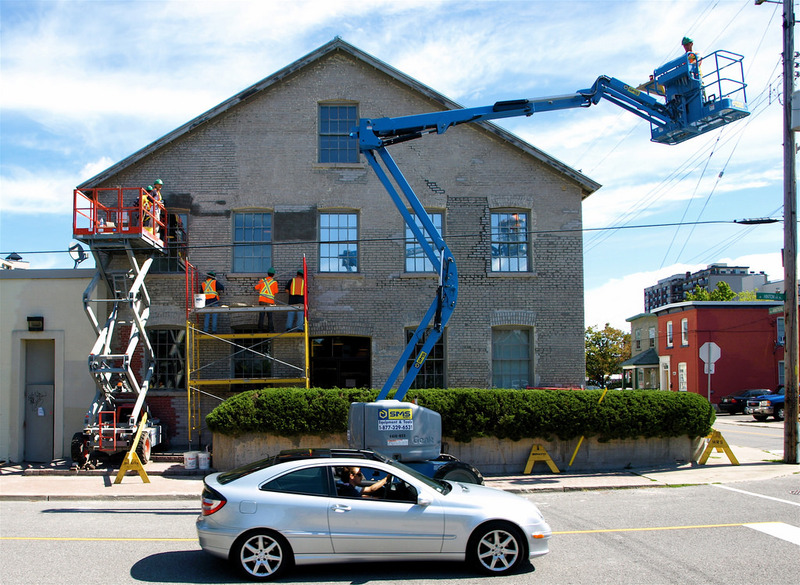 He then purchased the neighbouring lot 1516 from the OLA in August, and built 96 Hinton Avenue. The next house built on Hinton was construction south of Richmond Road, on the spot where the double of 136-138 Hinton now stands. William J. O'Meara, a conductor with the electric railway, built a house here between 1899-1900. It was a very small, 2-storey wood house, set a fair distance back from the street. It was demolished around 1950 and replaced by the double. On June 20th, Elizabeth A. Stott purchased lots 1504 and 1530 for $220. 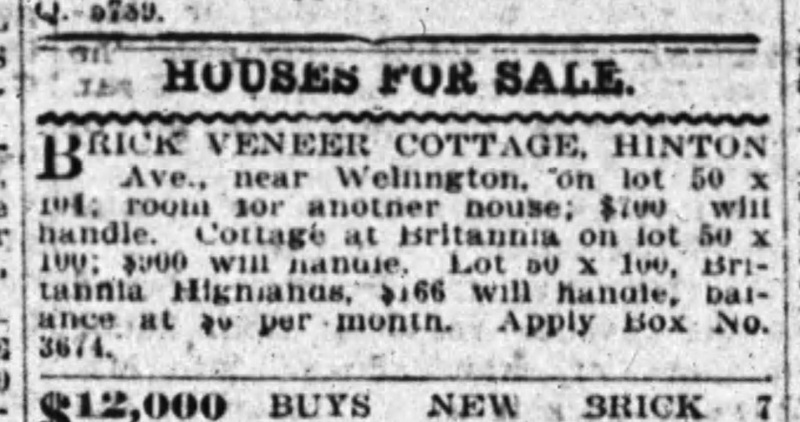 She would sell lot 1504 almost immediately after to Nap Lepage, who built a home by the north-west corner of Armstrong (which was then known as James Street). This house fronted onto Armstrong, 281 Armstrong, and was demolished in the 60s. (Lot 1530 south of Richmond Road sat vacant until the 30s). 1900 saw three more houses built on Hinton, at 74 (built by butcher William H. Mason), 78 (Charles Lapensee, an engineer who worked for James A. Forward) and 86 (Louis Visseau, a general labourer). All three are long gone, demolished in the '50s, '80s and '30s respectively. 146 and 152 Hinton came next, around 1901-1902, and then 130 Hinton in 1903, 101 Hinton in 1904, 140 in 1906, and so on, usually with only one or two new houses popping up on the street per year, until after about 1908 when the real estate market in the area really took off. 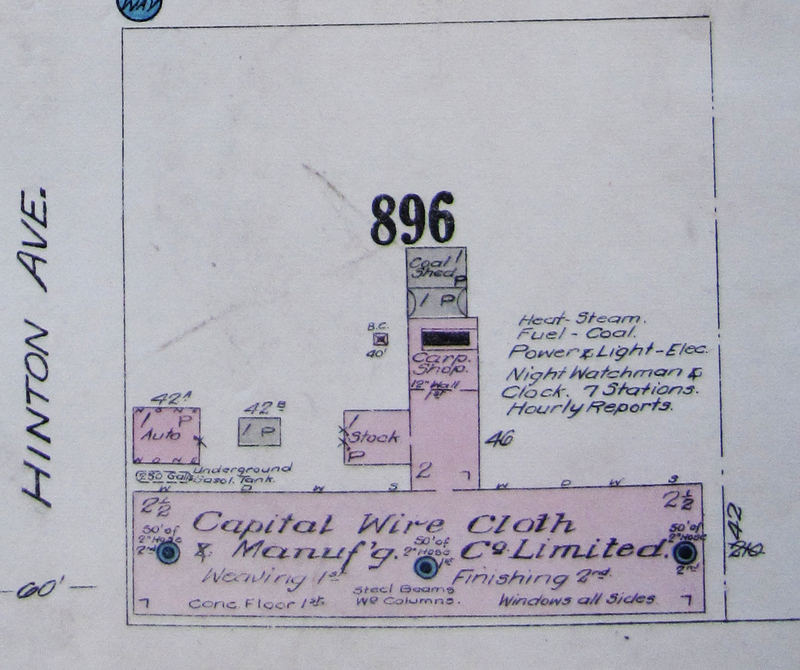 Despite the boom on Hinton Avenue during this period, no lots south of Tyndall Street would sell until 1909.
is stone or concrete block, and grey is shed/outbuildings. The land south of Tyndall, though laid out back in 1895, did not begin to sell until 1909. This was likely due to the OLA's preference to push the more northerly lots, though it can be reasoned as well that a lack of infrastructure (sewers, water, electricity, paved roads) likely kept buyers away, though oddly investors as well. OLA may have intentionally not offered those lots for sale at the time. Tyndall in fact was originally to run west of Holland Avenue; on the original plan from 1895 above you can see that it runs west all the way through Harmer. The streetcar line was built between 1899-1900 a little to the north of this Tyndall area, and so by 1909, it was realized that a new street would need to be laid out. Thus Byron Avenue was created through an application to the Board of Control, a new 60 foot-wide street to run alongside the streetcar tracks (the tracks came before the street). 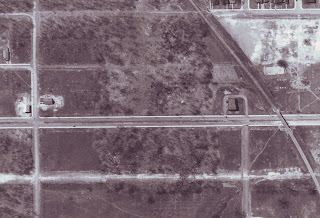 The "old" Tyndall Avenue portion west of Holland was erased, and future OLA subdivision plans for Wellington Village used a layout with Byron Avenue, not Tyndall. 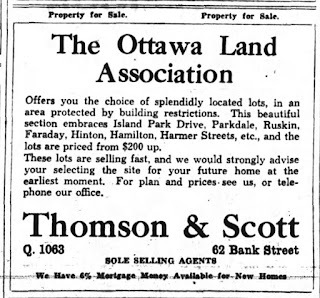 The first lot south of Tyndall on Hinton Avenue was sold in 1909. This was lot 1564 (now the site of the new duplex at 190-192 Hinton) to Hugh Boone. 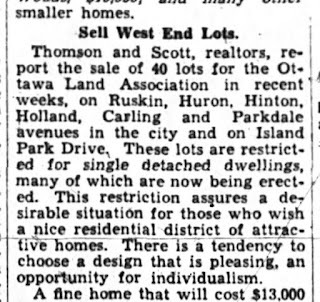 Oddly though, within a year, almost all lots between the railway and Tyndall were sold. 1909-1910 was clearly a boom period for this area. 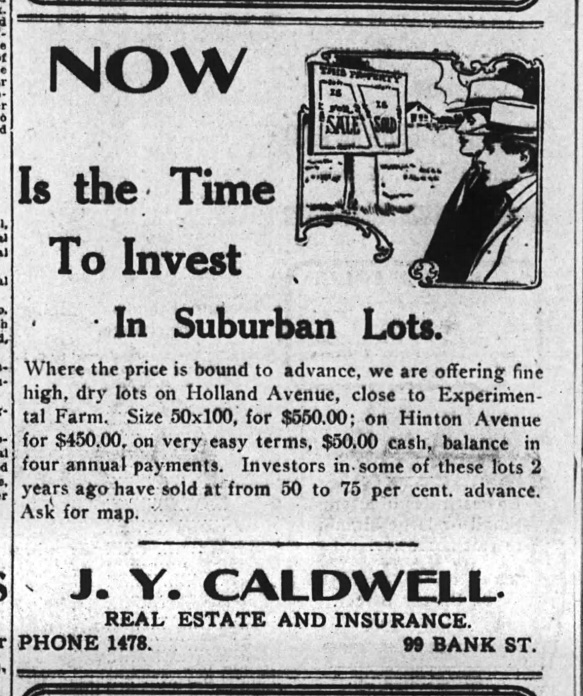 The OLA, through their sales agent, prominent Ottawa agent J. Y. Caldwell, had a fairly aggressive marketing campaign for the "suburban lots". 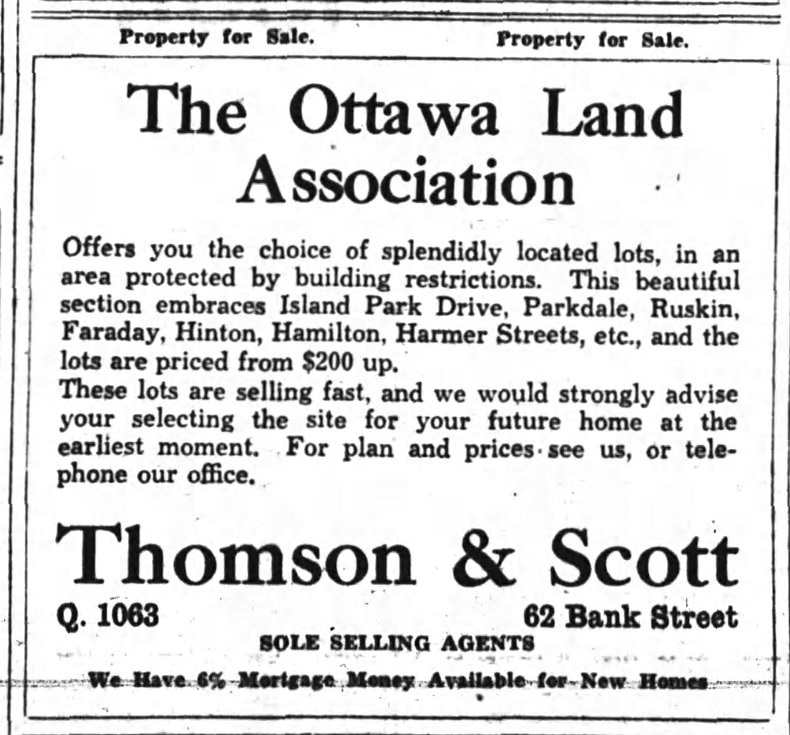 Despite the sale of all the lots, there was still to be a 7 year wait until the first house was actually built on Hinton Avenue south of Tyndall! 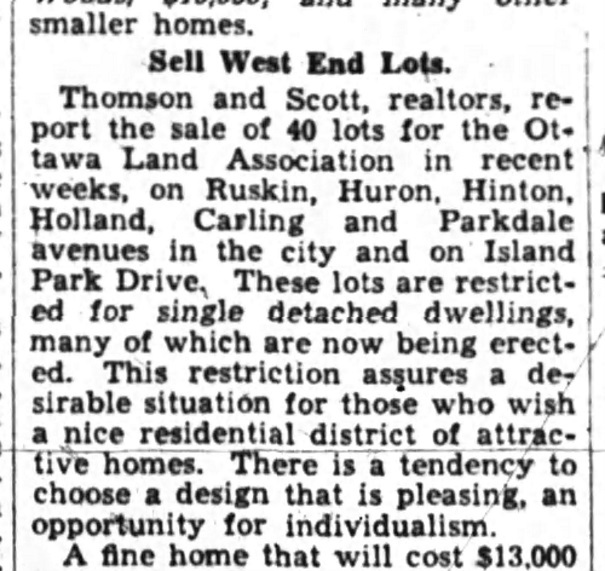 Things got moving when Walter B. MacDonald, a civic works engineer with the City of Ottawa who lived downtown on Arlington Street, decided to sell his investment lots. 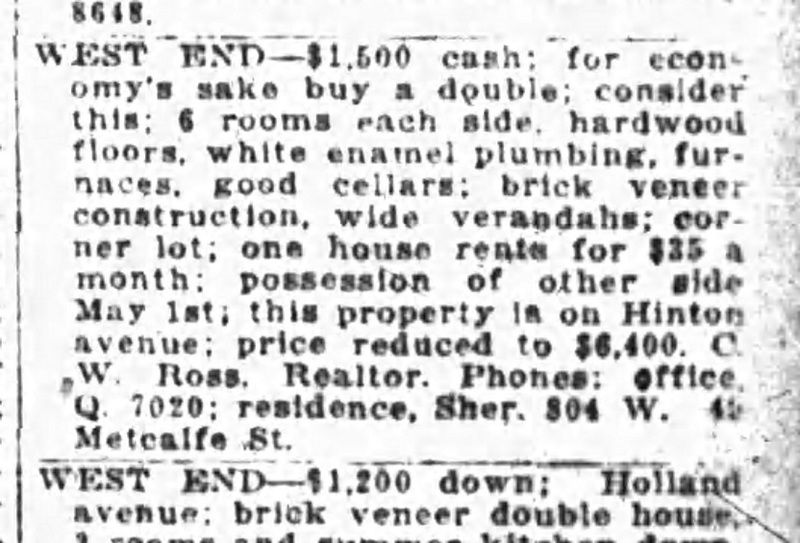 He had pooled together $4,750 from an incredible seven different lenders in 1912 in order to purchase seven lots on the east side of Hinton (essentially the equivalent of what is now 189 Hinton all the way to the end of the street at 213 Hinton). 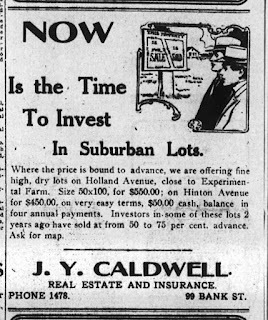 In 1915, he sold these lots in two halves to new investors (for his efforts, he made a little money, but it wasn't far off break-even). 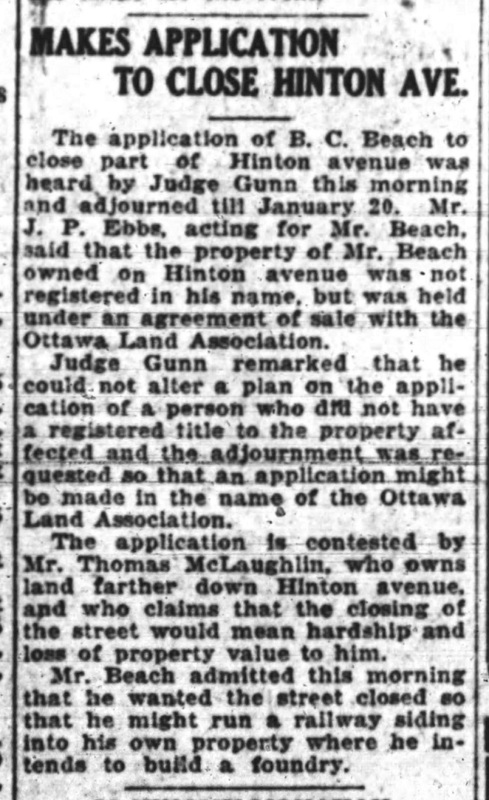 The investors who bought this land where 201 to 213 Hinton exist today were Ottawa lawyers Louis A. Smith and Frederick S. Dunlevie. They began to flip individual lots (and half lots), mostly to small-time home builders. And this is where construction on this part of Hinton began. 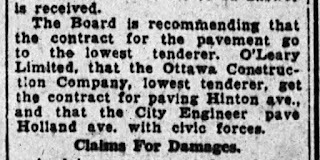 In November of 1915, contractor Isaac Villeneuve acquired lot 1393 and began construction on 201 and 203 Hinton Avenue. 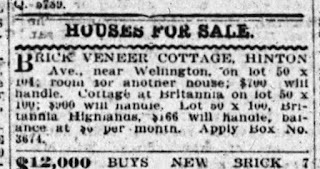 He completed 203 Hinton by the spring of 1916, and on April 4th, it was sold to its first occupant, Norman R. Cole, an "electric instrument maker" with the Department of Inland Revenue. Thus 203 Hinton holds the distinction (by a few months) of being the first completed and occupied house on this part of the street. 201, 205 and 209 Hinton were not far behind, and were completed in the late summer of 1916. 201 (and I believe 209 as well) by Villeneuve, and 205 by Thomas Holman. Back to the west side of the street, as mentioned above, the very first lot sold in this area of Hinton was in 1909 to Hugh Boone (lot 1565). This lot was the first to be built on on the west side, but not until about 1919, when Miguel Shea built a 1 1/2 storey wood-frame home. This home survived until the late 1960s. 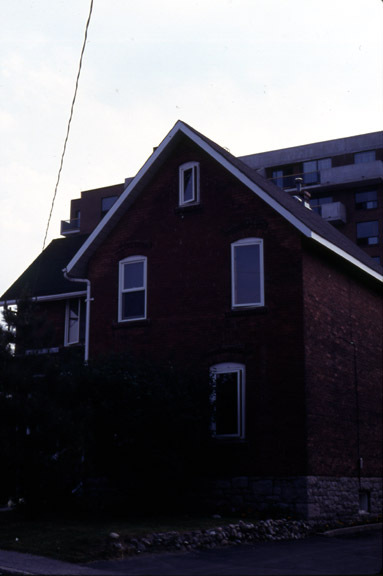 The photo below shows this house as it was just prior to demolition. The lot remained empty until the new duplex was built in the late 1990s (the "after" photo below). June 24, 1927 view of Hinton Avenue South, looking west. heavily treed at the time. now visible due to the building of some infrastructure. 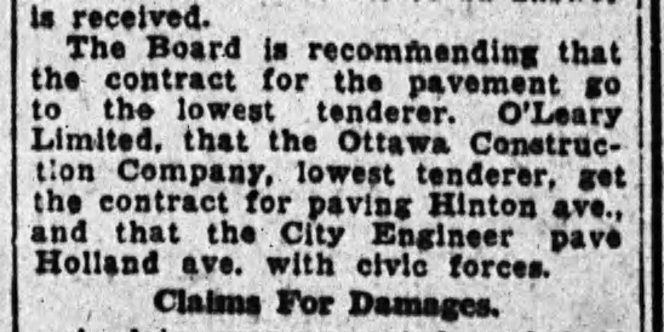 In October of 1930, the Board of Control for Ottawa approved a project to install sewers on Hinton and Hamilton between the CNR tracks (now the Queensway) and Carling Avenue, at a cost of $19,500. The work was originally to be done during the winter of 1930-1931, but delayed until late 1931. 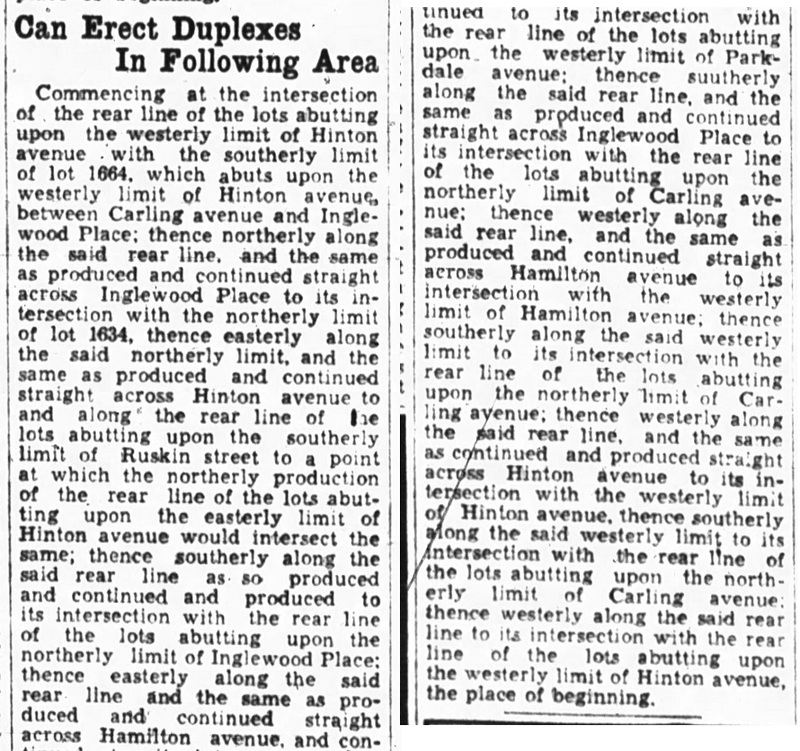 In August of 1931, the sewers as well as grading of Hinton from the Queensway to Carling was approved. The grading of Hinton was to cost $9,000. (Hamilton was also being done as well, along with Sherwood from Fairmont to Parkdale, at 90 feet wide). Due to depression, work to start was contingent on federal and provincial funding being received as planned for local improvements. This was part of the first relief works program, to create jobs for underemployed men in the area as well. 150 men and more were to be hired from a pool of registered unemployed men, then counting at 5,552 (2,346 of them married). Lots sales were initially fairly slow, keeping in mind the economy was still weak at the time, and the threat of another world war was prevalent, particularly as developments in Germany had the rest of the world keeping a careful eye. Construction on the first houses in this section started in 1935. The first completed house was that of Harold Corken and his wife. Corken was a prominent citizen, holding the position of manager of Canadian Department Stores in Ottawa (a chain operated by Eaton's). 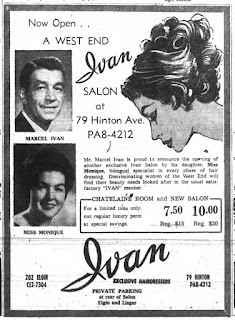 However in March of 1936, a farewell party was held in his honour as he was returning home to work for Eaton's in Montreal. His house was I believe 397 Hinton Avenue. 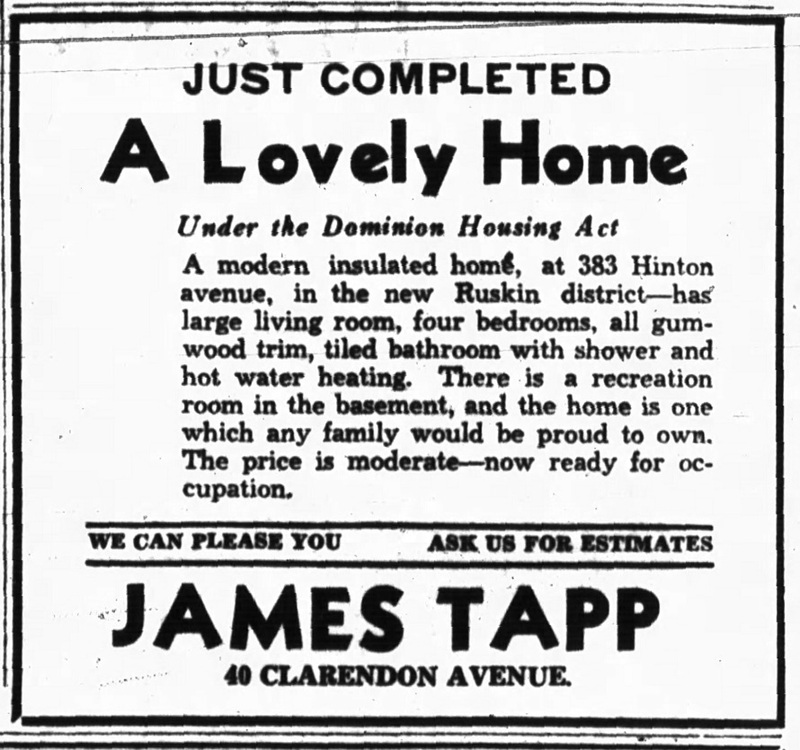 By October, three more houses were complete and occupied on Hinton: 399 (which I believe was not originally a duplex) occupied by John Dufort, a sales manager; 406 occupied by Charles Moore, a truck driver and 408 occupied by two families, Earl R. Jarvis, a manager, and Frank Martineau, a salesman. By summer of 1936 these houses were completed on Hinton South: 379, 381, 383, 385, 397, 399, 403, 405, 407, 409, 411, 415 and 421 on the east side; 380, 384, 386, 392, 394, 406, 410, 412, 414, 416, 418, 420, 424, 432 and 434. Beach Foundry in 1979, a few years before closure. Beach Foundry would have been seen from far down Hinton looking north, as it was a wall of offices that looked down Hinton Avenue. At the corner of Spencer were two other long-time Hinton Avenue businesses. On the southwest corner was J. Robinson & Son, a brass foundry which was built in 1941 and operated until at least the late 1970s. It was operated by Joe Robinson and his son Charles. Joe had apprenticed in England for seven years before going to work on his own in Canada after WWI. Previously he operated another foundry (Canada Brass and Machine Works) over on Hamilton, before deciding to build a new, and simple building on Hinton, which he ran well into his 80s. 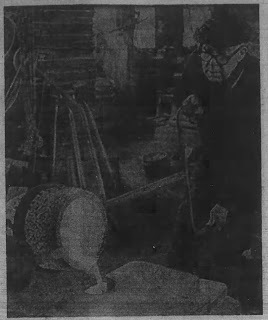 In 1975 he was profiled in the Ottawa Journal, then 85 years old, and his business was the last brass and aluminum casting foundry in Ottawa and one of the final few in Canada. I can't find a really good photo of the building on its own, but it can be seen pretty well in one of the low elevation aerial photos I have, cropped below. Sapacon is now at this site now, but I do not believe the building is the same, or if it is, it has been renovated and expanded extensively. Joe Robinson at age 85, pouring aluminum. Ottawa Journal, April 8, 1975.
corner, and Spencer Street from top left. 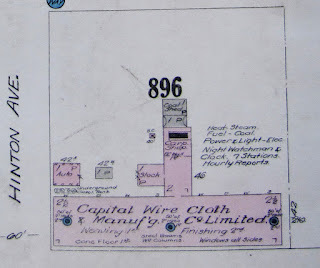 Across from Robinson's, occupying the entire block between Spencer and Armstrong, is the former Capital Wire Cloth & Manufacturing Company facilities, much of which still stands today, including portions designated as heritage. (http://newswest.org/easyread/archives/1376 for more info on the building, which expanded multiple times over the years). 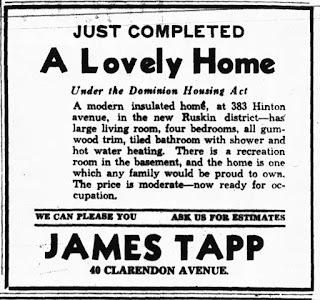 The original portion built in 1912 was on Hamilton, but a renovation in 1919 extended it over to Hinton (and it was later expanded multiple other times). Capital Wire Cloth built on Hintonburg's industrial past, carrying on with this new technology which survived over 60 years in this location (from the Hintonburg CA website: "Wire cloth was used in the manufacture of paper from pulp. The cloth, really a fine-gauge metal screen, was dipped through the pulp mixture to strain the solids from the liquids. The extensive paper making industries at the Chaudière were ready markets for this product. The wire cloth was woven on very heavy looms set onto the concrete floor in the main section of the factory. Finishing of the cloth, which involved stretching it on large tables, was carried out on much lighter equipment located on the second floor.") It has always been my intention to do thorough post on the history of the building, and track down some vintage photos of it. For now, the best I can do is the photo below showing it mid-restoration a few years ago when they blasted off the old paint and gave it the nice white finish it has now. the building as it originally would have looked. Along Hinton north of Wellington are all residential houses, though a few businesses have moved in and out over time. #75 at the corner of Armstrong was recently for a few years the offices of the Ottawa Sport and Social Club (OSSC), but now appears to be reconverted to residential. Meanwhile OSSC has moved up the street slightly to 85 Hinton, another converted house. Two doors down at 83 Hinton, this former house now appears to be converted in to small commercial units, for three or four companies. I note that Myticas Consulting, BNuvola Solutions and City Wide Properties all appear to have offices in there, or at least did as of the fall. 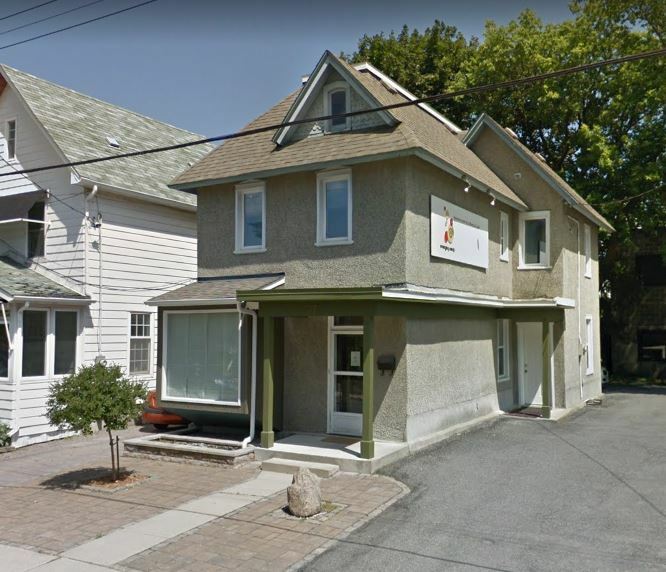 And finally, 97 Hinton, the original/oldest house (aka the Jabez Kenny house) is now commercial, home to Emerging Minds, a clinic for children with "autism and other neurodevelopmental challenges". (My middle child Emmett had a few speech therapy sessions there last year; it is a great clinic, with some wonderful staff). At the intersection of Wellington Street, Hinton Avenue has seen a lot of businesses come and go over the years. Technically the businesses front on to Wellington Street, but it is worth covering the four corners for a bit of history. There are currently two parking lots on the corner, but it has changed over the years. The northeast corner might be easiest to start with. 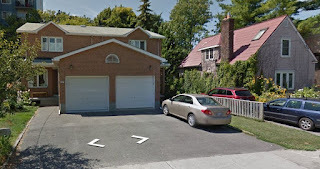 It is now the parking lot for West Park Bowling and Daniel O'Connells, but from 1898 up until the 1960s, two houses stood in this spot, at 1213 and 1215 Wellington West. 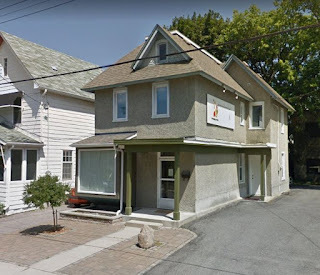 1215 I have discussed previously on this blog, it was the long-time home of the Charlie Leung Chinese Laundry (pictured below), while 1213 (no photo) was built by David Rice as a home, but in the 1920s was used as a physician's office by Dr. George M. Pennock. John and Amy Young moved in to that house in 1929, where they remained until the mid-1960s and it was demolished. This spot during the 1980s (and probably as far back as the 70s) had a photo finishing/development booth in the corner of the lot. As a kid I remember the vacant, abandoned kiosk sitting there for years, probably until about 1998 or 1999. 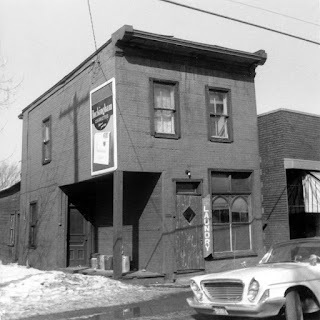 On the northwest corner, this is now the Royal Oak. But that is a new building, constructed sometime around 2000-2001. Before that it had been a parking lot for some time. 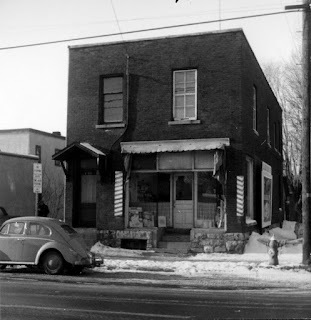 But going way back in time, a building was constructed here by Thomas Burnside about 1901 (1217 Wellington), and started life as the home for the 'Royal Social Club', a "society" organized for the young men of Hintonburg. Not long after it became a grocery store and then butchers for a number of years (including the name Jacob Saslove which stands out, operating there in 1927). But the building was best known as "Ed's Beauty Parlour" and barber shop, operated by Edward Baker from 1930 until he retired in 1969. It was later Topaz Imports, Orphan Annie's craft shop, and Alex's Camera Repair, before being demolished in the 1980s. and Hinton. Then Ed's Beauty Parlour & Barber Shop. On the southwest corner is now the parking lot to the new Pet Valu and former CAA & Hasty Market building. 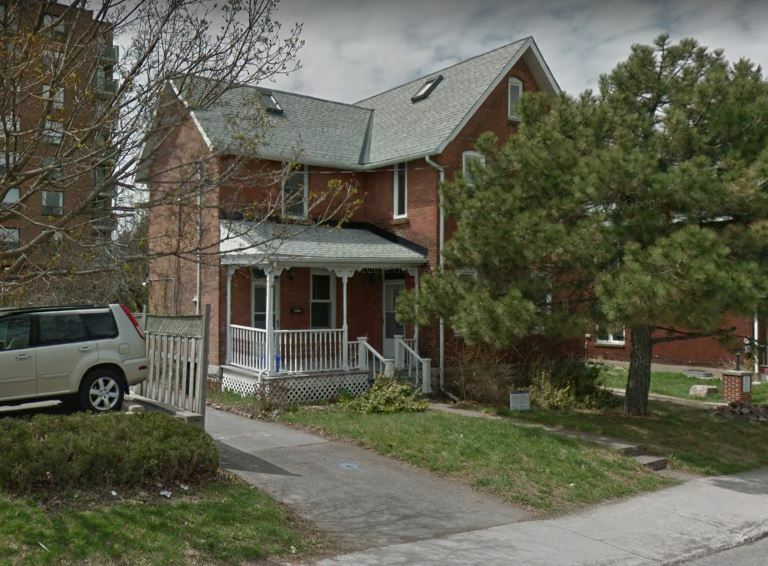 It has been a parking lot for 70 years, but prior to that, a house stood here that was built for esteemed Hintonburg Town Clerk William A. Mason around 1901 (1220 Wellington). From 1913 until 1928 it was a grocery shop, and in 1931 it became Albin Cmikiewicz's "Imperial Shoe Renewing Service" shop. Albin was a 22-year old immigrant from Poland, whose brother John had come to Ottawa a few years earlier and opened a similarly named shop (Imperial Shoe Repair) on Bank Street, which he ran into the 1970s. 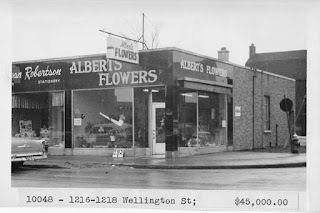 Albin ran his store on the corner of Wellington and Hinton until 1948. It was demolished to make way for a parking lot for the newly built Dominion grocery store next door (what is now the Pet Valu). 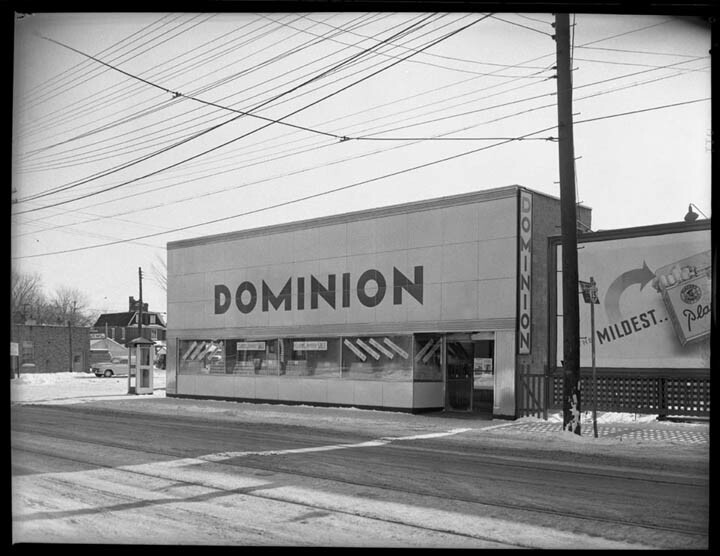 Sadly I don't have a photo of the Imperial Shoe Renewing Service building, but below is the original Dominion store (now the Pet Valu), from 1954. It remained a Dominion into the early 1980s. 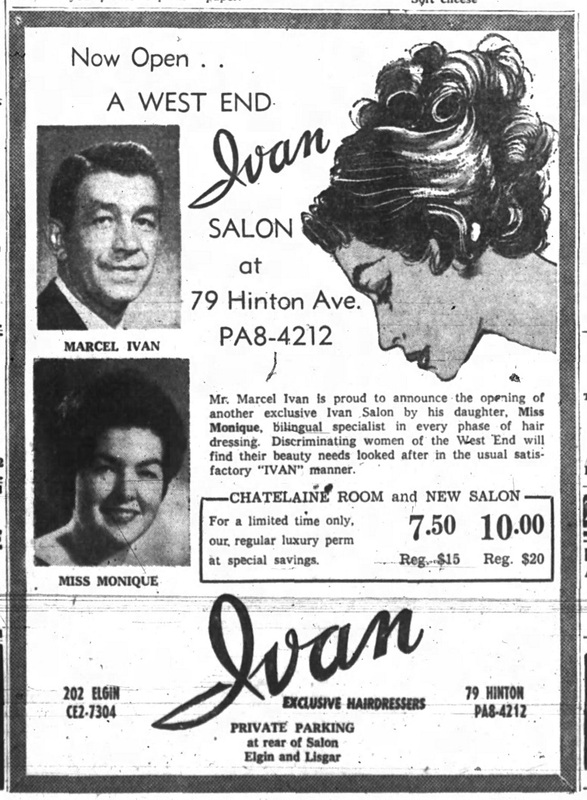 January 30, 1954 (Ottawa Archives CA-3022). On the southeast corner, this spot was vacant for many years, in fact it was not built on until 1947, when the single-storey commercial block of four units was built. It featured F. W. Towsley's mens wear shop, Stephen-Harvey jewellers, Susan Kennedy's stationery, and Albert's Flowers at the corner. Many different shops have operated out of these locations, which now features Anthony's pizza shop at the corner. This spot was the long-time home of Sun Kwong chinese restaurant. 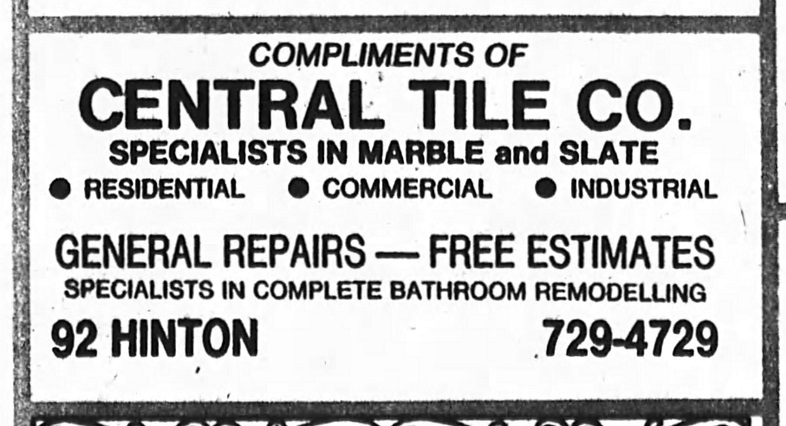 of Hinton and Wellington, sometime between 1954-1957. South of Wellington Street, I can find no reference to any commercial businesses on or along Hinton Avenue, in either the north or south sections. Well, at the south end of the street at Carling Avenue is the Central Medical Building (west corner) and the Duke of Devonshire retirement residence (east corner). 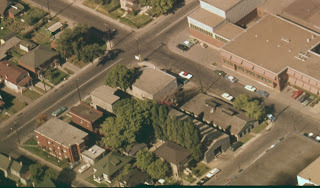 The west corner had been the location of McNeil's Drug Store at 1111 Carling during the 40s and 50s before the medical building was constructed in the very early 1960s. Meanwhile a gas station existed on the east corner from the 50s until the late 70s until an office building was built there (and later converted to the Duke of Devonshire maybe ten years ago). 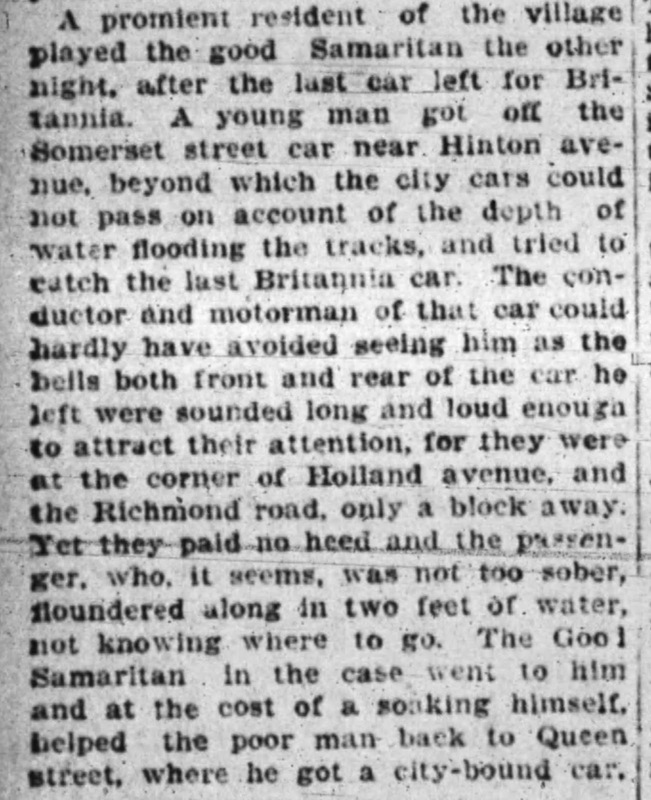 The first mention of Hinton Avenue in print came in the spring of 1899, by way of its first residents, the Kennys. 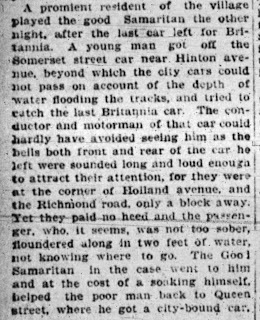 A random story from 1904, where someone got off one streetcar attempting to transfer to the Britannia line, made challenging by the two feet of water along Richmond Road near Hinton! On September 28th, 1952, the final trains ran on the Renfrew subdivision line of the Canadian National Railway, and Nepean Junction diverted all rail traffic on to the Beachburg subdivision line. This eliminated all rail traffic on the lines that crossed Hinton Avenue. Almost immediately, the Federal District Commission (the forerunner of the National Capital Commission) began acquiring additional properties alongside the former Canadian National Railway route. The Greber Plan, produced by Jacques Greber under the direction of Prime Minister Mackenzie King and released in 1950, called for the complete reorganization of Ottawa’s road and rail network. Included amongst the various recommended parkways was an east to west expressway along the existing CNR line. Commencing in 1954, the FDC purchased properties alongside the CNR line, as there was a requirement for an expanded corridor through the existing line. Rail lines were removed, and preparations began towards the construction of the much needed thruway. On October 15th, 1957, Queen Elizabeth II set off an explosion of dynamite at Hurdman’s Bridge, commencing officially the construction of the Queensway. Back to Hinton Avenue itself, between 1959 and 1960, four houses on Hinton north of the railway line were expropriated and removed to make way for the new Queensway: 215 and 217 Hinton on the east side, and 218 and 200 on the west side of the street. These four houses were either moved or demolished during this year. Many of these houses were saved and moved elsewhere during the Queensway construction, but the movement of these homes are not easy to track. 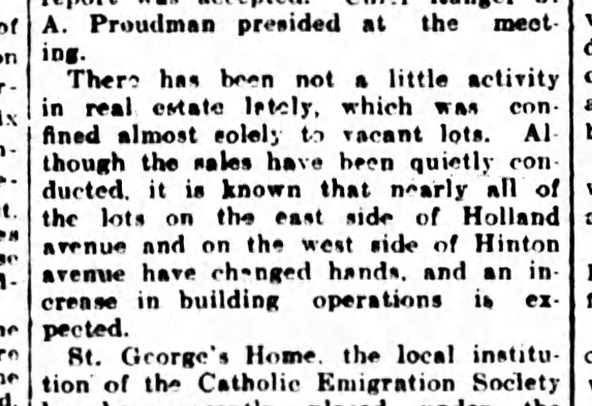 Records are sparse as houses were sold as if they were pieces of equipment; the buyer was expected to show up and remove the house as they wished. The photographs below show the early stages of clearing for the Queensway. The tracks have been removed, the expropriated houses removed, and grading commenced for the construction of the Queensway. The photos also provide a pretty cool oblique view of the houses on Hinton around the Queensway. April 1961. Hinton and the east side of Holland, looking east. starting (bottom, centre). Fisher would be just below it. the north side of the Queensway. On December 11th, 1967, Judge Peter Joseph Macdonald heard the case for the proposed by-law changing many street names in Ottawa, primarily to add north-south designations for streets split by the new Queensway. 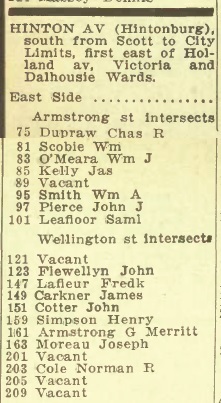 Included in this by-law was the modification of the name of Hinton Avenue to both "Hinton Avenue North" and "Hinton Avenue South", along with many other streets in the area which to this day continue to have the "North" and "South" markers in the street name. One final photo... It is the north end of Hinton Avenue, in the summer of 1984, as Beach Foundry was mid-demolition. You can still see some of the Beach buildings in the photo, but a large portion of the lot has been cleared. The Holland Cross condos would be built starting in 1986. North end of Hinton Avenue, June 5, 1984.
and Holland Avenue along the bottom. Thanks so much, I'm glad you found it interesting! Each street has such a unique and different history, it's fun to delve into it. I know these posts can sometimes be a bit long, but I try to cover off all the different angles why someone may be interested in reading it. Not to mention, there is just a ton of info that can be dug up on one street! Hinton Avenue is a great street for sure. Cheers! I lived at 250 parkdale I always wondered how old the house was. My mother use to say that at one time the people had to walk a few blocks down to get some water. And that our house was about 100 year old. I was born in that house at some point I discovered news paper from 1922 which was the date of my mother's birth and was used for isolation perhaps.I found under a layer of old wall paper. The paper was used for insulation. I just found out that the house was demolished to build condos which made me sad that I don't have any picture of my childhood home. I was 11 years old when we moved. Please send me picture or information if you have any idea as how I can possibly find any of the house before demolition.